Photo Caption: Student-members of the Berkeley College Collegiate DECA club in New York City got the opportunity to meet Grovert Fuentes of North Bergen, NJ (above), founder and CEO of Fit Lifestyle Box. Mr. Fuentes, who graduated from Berkeley College in May 2017 with a Bachelor of Business Administration in Marketing Communications, was invited to visit the campus on June 21, 2018, as part of DECA’s Business Leader Series. 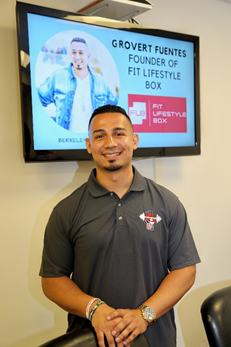 Mr. Fuentes talked about his struggles in early life, how he found his way, and his life now managing Fit Lifestyle Box, a monthly fitness subscription box business. He offered advice on how to approach life after college and going forward. “Find your purpose,” he told the students. “Find your why in life.” Rebecca Aguilera, Collegiate DECA President, said, “All of us were captivated, with some students already planning to start a business after college.”Ms. Aguilera, who attended Berkeley College on a DECA scholarship, graduated in May 2018 with a Bachelor of Business Administration in Marketing Communications, and currently works in public relations at Nicholas & Lence Communications. She praised Collegiate DECA and its programs that allow speakers like Mr. Fuentes to share their expertise. You can view a story about Mr. Fuentes here and see him featured in the opening segment on the Lifetime TV Network program “Military Makeover” here.